It’s not amusing. Donald Trump’s vicious daily rants on social media platform, Twitter, have taken a dangerous turn for the worse. After news broke that North Korea has expanded its nuclear capabilities, Donald Trump didn’t discreetly and seriously handle this impending threat with the Department of Homeland Security. Instead, he took to Twitter where he's threatening North Korea with military action and posting pictures of bomber planes. That’s right. Donald Trump publicly escalated an already dangerous conflict with a foreign adversary over a social media platform. Instead of suspending his account the first time Trump used it to threaten a foreign adversary, Jack Dorsey let Donald Trump get away with abusive and dangerous behavior that the average user would be banned for. Now, he's using the platform to escalate the threat even further. Donald Trump went onto Twitter and embarrassed himself and everyone else by using it to threaten a nuclear war while being juvenile instead of using experts and diplomats at the State Department. Enough is enough! 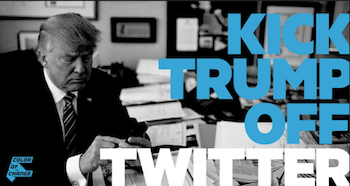 Tell CEO, Jack Dorsey to kick Trump off Twitter now! Please kick Donald Trump off Twitter. Now, he's using the social media platform to threaten nuclear war. Donald Trump has launched an assault on the very communities that drives Twitter to flourish. His abusive behavior has violated your user agreement multiple times while rising to power by promoting hateful conduct towards Black people by providing succor to white nationalists after Charlottesville, he has promoted violent threats against protesters, he’s called for the mass harassment of Latinx folks, and Muslims. Trump has used Twitter to destroy the very discourse and community your company has aided in fostering. Twitter is a platform that can be used for good. But the potential and power of the platform are undermined when Twitter allows Donald Trump to violate the terms of service and now, threaten a nuclear exchange. Please kick him off Twitter now.